"Assessing Assessment Within the Block Schedule"
Assessment is a key element in any educational program. It involves the critical idea of making sure that what needs to be taught has been taught and what needs to be learned has been learned. 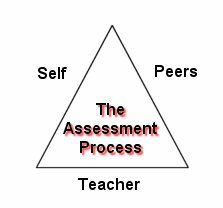 This paradigm implies that assessment is a two-way street. The effectiveness of the teacher is as important as the responsibility of the student do the work and to learn the curriculum content. All too often there is a disconnect between evaluating what the student has achieved and the ability of the teacher to motivate the student and communicate the specific subject matter. Taken together, we can get a clearer picture of how much learning is actually taken place. Assessment can indicate pathways to remediation for the student, but it also has the ability to show the teacher how to improve effectiveness in content delivery. How do we assess what students have learned? How can we accurately determine what elements of the teaching learning interaction is the responsibility of the student and what is the jurisdiction of the teacher? And once we have determined what roles each must play to achieve the academic goals set by the curriculum, how can we make recommendations that will intensify the learning process? Traditional forms of assessment such as test-taking and essay-writing are giving way to alternative methods that may include performance-based evaluations such as presentations or projects. No matter which method is used to assess student learning, students need to know how they will be assessed before taking on a learning task. Such knowledge will most likely include a set of criteria which the students understand as the standard for performance on a given task. One way to achieve a higher success rating is to plan a curriculum module backwards. It is up to the teacher to know what must be taught and learned, so the goals are the first element to be developed. These will usually come from the standards of learning set by the state mandates. The teacher will then employ creativity and imagination by developing the general learning activity. The specific type of project and what it will cover should come into focus. Students may be engaging in a creative writing exercise or develop a poster on a given topic. Then the teacher will create a rubric of standards that will be used to evaluate student learning. If the task is to develop a poster in the style of the New Deal agencies, the poster must have an image or graphic, a slogan, and the name of the agency and its abbreviation somewhere visible on the poster. The slogan must reveal the function of the agency. Point values can be assigned to these indicators that students gained and understood information of each agency, and that they have applied the learning to the development of the poster, which reflects what they have learned. Additional levels of effort, such as originality, creativity, colorfulness, attention to historical detail, and use of propaganda techniques would also be scored on a point scale. The planning process would lead the teacher to develop the rubric first. Then additional details and features of the project could be fleshed out based on the standards set out by the teacher. Today's assessment paradigm involves a triad of inputs when arriving at a final picture of what has been taught and learned in the modern classroom. The teacher makes up the baseline of assessment because he or she is the final arbiter of a student's grade. But the teacher can now take into account the relationship of the students with each other as they engage in the group process. Students can assess each other in respect to group functioning elements such as collaboration and cooperation. The teacher needs to help students identify what elements make up cooperation within the group, and once those qualities have been identified and point values have been quantified, the students then has the tools to assess how well the peers within the group achieved those goals. Finally, the students can examine his or her own level of functioning when it comes to helping the group achieve its academic goals. This new paradigm helps students examine previously unassessed skills such as interaction with peers and contribution to the final product. these new skills are the ones now called "soft skills" or "people skills" by the post-industrial business community now forming in the Internet age. It is now the responsibility of the educational community to make sure students move into the New Economy with a good understanding of how important those new skills are and how they will be employed in the conference rooms of the Twenty-First Century. In our workshop, we demonstrated how to evaluate whether or not individuals in the group were performing according to pre-established criteria. The instructor had us form triads and engage in the three-part interview centered around a specific personal or professional problem. The skill being assessed had to do with some aspect of our ability to listen actively. One member of our triad was a data-gatherer, taking notes and marking down how often we engaged in the target behavior or how often we violated our own rules of interaction. It was amazing to see how the group members perceived themselves and their behaviors as opposed to how they were perceived by the data-gather. When applying this process to middle and high school students, they will be given a chance to comment on the functioning of their peers and themselves, but they will need strictly outlines guidelines on what to look for. The teacher will need to observe carefully what happens in the classroom to corroborate student evaluations, which may be fraught with subjectivity, interpersonal agendas, and inaccuracies. The teacher must clearly outline expectations for students before they engage in any group activity. The teacher will let students know that the project involves effort, participation, and a positive attitude. The teacher will ask students to evaluate themselves and provide feedback on how well communication has taken place within the group. 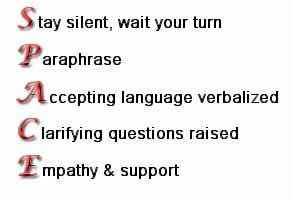 The student must engage in active listening by staying silent, waiting for appropriate times to interject, paraphrasing what is stated within the group, using accepting language, asking questions, that clarify, and by providing empathy and support. Students within the group can identify effort when students stay on-task, offer new ideas, and come to the table equipped to do the task. The teacher can assess participation when students share responses with the group and ultimately with the class. In importance of following directions must be stressed by the teacher, along with the value of looking for details when analyzing data. When students hare opinions and make comments that are constructive and relevant, they can give each other high marks as the teacher confirms their evaluation through his or her own observations. Another area students and teachers can use to assess student progress within the group structure is that of having a positive attitude. Students must demonstrate and observe a respectful approach regarding the opinions of others. Their excitement or enthusiasm may be evident, and when a student is a self-starter and makes the best of any situation, even in adversity, the group will be successful in the area of attitude. Assessment is an important piece of teaching under the block schedule because so much information can be taught and learned in that setting, It is critical that the teacher have a set of tools that fairly outlines student progress, and by extension, teacher effectiveness. Accurate assessment that uses a variety of approaches can be sued by a teacher to give multiple opportunities for success to all students. Such opportunities are especially important to those students who experience low levels of motivation or who are wanting in aptitude in a specific skill. When assessment approaches are varied and employ some aspect of mastery learning, the door is opened not just for those students who can express themselves well verbally or who can retain minute facts that can be recalled on a traditional exam. Having a greater block of time in which to engage in these alternative assessment styles gives the teacher many more options when it comes time to see what students have gain from their time in class. In the end, all students benefit, both those who thrive in traditional educational setting as well as those who require a modified approach.